You go to direction of Berlin - onto A 111 till it merges with the A 100. Stay on A 100 and use the exit ICC or Kurfürstendamm or continue to go to exit Hohenzollerndamm. If you use the exit ICC turn right and right again, you are now in Kantstraße. Follow it to Kaiser- Friedrich-Straße, and turn right. Then turn left onto Kurfürstendamm and turn at Olivaer Platz to the right at the small traffic light before the crossroad. Then continue straight on to Lietzenburger Strasse. On the third big crossroad turn right onto Nürnberger Strasse/Spichernstrasse. Straight after turning you will need to go left again into Geisbergstrasse. Take the first turn to the right and you are in Grainauer Strasse. The houses are on the left side. If you take the exit Kurfürstendamm drive straight onto the Kurfürstendamm. Drive along Kurfürstendamm and turn at Olivaer Platz to the right at the small traffic light before the crossroad. Then continue straight on to Lietzenburger Strasse. On the third big crossroad turn right onto Nürnberger Strasse/Spichernstrasse. Straight after turning you will need to go left again into Geisbergstrasse. Take the first turn to the right and you are in Grainauer Strasse. The houses are on the left side.. If you go to exit Hohenzollerndamm, turn left onto Hohenzollerndamm and follow it to the end. It becomes Nachodstraße on a four lane intersection and after you have reached Nachodstraße turn left at the first traffic light. The houses are on the right side. You have to walk into the courtyard to reach the entrance to the apartments. Go to direction Zentrum/Zehlendorf on A 115. When this ends, take the exit ICC and then turn right into Kantstraße, or follow directions from North or you turn onto the Stadtring Süd (direction Dresden / Schönefeld) and go to exit Hohenzollerndamm Turn left onto Hohenzollerndamm and follow it to the end. It becomes Nachodstraße on a four lane intersection and after you have reached Nachodstraße turn left at the first traffic light. The houses are on the right side. You have to walk into the courtyard to reach the entrance to the apartments. If you come from South East or North East, follow Berliner Ring. 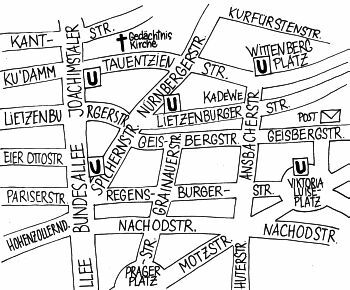 If you come in via Stolpe, follow the instructions from the North, oif you come in via Zehlendorf, follow the instructions from the South. Get off at Hauptbahnhof or Spandau and take the S-Bahn to Zoologischer Garten. There, find the U-Bahn no. 9 direction Rathaus Steglitz, and go two stops. Get off at Spichernstrasse at the front of the train. Follow the signs to U-Bahn line 3 but cross underneath the line and take the right exit to street level. From there, proceed through a house that you can walk through into Regensburger Strasse. Walk along and turn on the first street to the left, that is Grainauer Strasse. Cross the street and after 250 m you will see a wine shop and a small cafe and then a gate for cars to exit through an archway. Walk into the courtyard through that archway. House number 5b is the first house on the right in the back row; house number 7a is the middle house in the front row. Please be as quiet as possible in the courtyard. Take at Flughafen Tegel Bus X 9. It goes to S + U-Bahnhof Zoologischer Garten. There, find the U-Bahn no. 9 direction Rathaus Steglitz, and go two stops. Get off at Spichernstrasse at the front of the train. Follow the signs to U-Bahn line 3 but cross underneath the line and take the right exit to street level. From there, proceed through a house that you can walk through into Regensburger Strasse. If you arrive at Schönefeld you can take a Regionalexpress train (R7 direction Belzig) to Bahnhof Zoologischer Garten. The Regionalexpress is faster than the S-Bahn and costs the same. There, find the U-Bahn no. 9 towards Rathaus Steglitz, and stay on it for two stops. Get off at Spichernstrasse at the front of the train. Follow the signs to U-Bahn line 3 but cross underneath the line and take the right exit to street level. From there, proceed through a house that you can walk through into Regensburger Strasse. You can take the airport bus SXF1 to station Südkreuz. There take the S-Bahn S 46 direction Westend (Ring). Go to Heidelberger Platz station and change to U-Bahn Linie 3 towards Nollendorfplatz, and get off at Spichernstraße at the back of the train. Take the exit right behind you and exit to street level. From there, proceed through a house that you can walk through into Regensburger Strasse. Furthermore, there is the option of taking bus number 171 direction of Herrmannplatz and get off at U-Bahnhof Grenzallee. There you take the in die U-Bahn line 7 towards Rathaus Spandau and get off at station Berliner Straße. There, you change into U-Bahn line 9 towards Osloer Straße and get off at Spichernstraße at the back of the train. Follow the signs to U3 and take the right exit to street level. From there, proceed through a house that you can walk through into Regensburger Strasse. From Schönefeld Airport take the S-Bahn or the Schönefeld Express train which would be much quicker to Zoologischer Garten. Take that and get off and find the U-Bahn. Take the U-Bahn from Zoologischer Garten line 9 to Rathaus Steglitz. After 2 stops, get out in the front of the train at Spichernstraße. Follow the signs to U-Bahn line 3 but cross underneath the line and take the right exit to street level. From there, proceed through a house that you can walk through into Regensburger Strasse.